Amazon announces new Echo Show in the US | What Hi-Fi? The Echo Show has Alexa functionality, similar to Echo and Echo Dot, as well as a 7in touchscreen. Amazon has announced its touchscreen-equipped Echo, which has been rumoured since last November. 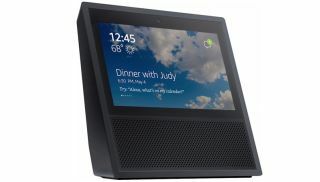 Set to hit the US market on 28th June, priced $230, the Echo Show has the same Alexa voice assistant as the Amazon Echo and Echo Dot, and features a nifty 7in touchscreen. The speakers are located below the screen, and if rumours are to be believed, they should perform better than Amazon's other products. Amazon says that they're "powerful, room-filling speakers with Dolby processing for crisp vocals and extended bass response". Much like the Echo, the Show has an array of speakers - but features eight rather than the Echo's seven. There's also noise-cancellation built in, so the Show can hear your commands while playing music from its pair of 5cm speakers. A unique feature of the Show is access to video and voice calls, so you can call people with an Echo or who have downloaded the Alexa app. While there's no word yet on UK pricing, we expect a straight dollar-to-pound conversion of approximately £230.